Maria Masionet says foreclosures have had a broader impact on her Brooklyn neighborhood, spurring crime. Dozens of disgruntled homeowners walked along East 42nd St. in Manhattan last Thursday afternoon shouting, “Stand up, fight back,” and “Freddie, Freddie, you can’t hide, we can see your greedy side.” Some spoke in hope that someone, other than themselves, would hear their voice. Their target was Freddie Mac, a federally chartered, shareholder-owned corporation that purchases mortgages from other lenders in order to increase the financing available for home purchases. Typically, Freddie packages mortgages into securities and sells them to investors. Freddie and a similar organization Fannie May are considered responsible for funding almost half of the home mortgages in the U.S. Both received bailout money. 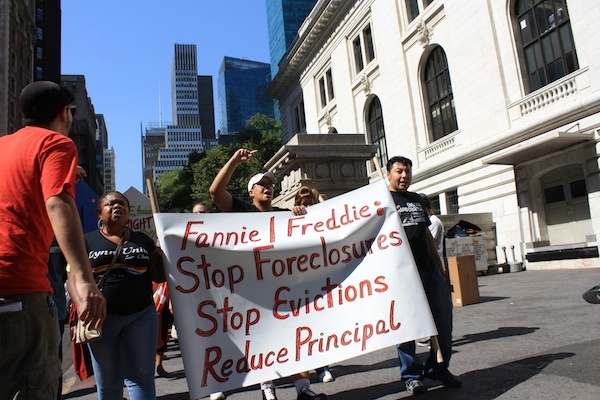 But the protestors complain Freddie is not doing enough to help homeowners caught in the foreclosure crisis. During the first seven months of 2012 (the most recent statistics available), the number of home loans Freddie modified fell by more than half compared with the previous year, from 75,000 to 36,000. Home loan modifications are seen as a vital defense against foreclosure, which remains a problem for the city. According to the most recent statistics from the Furman Center for Real Estate and Urban Policy, more than 2,300 buildings were hit with notices of foreclosure in the city in the first quarter of 2012—down significantly from the peak of the housing crisis, but up slightly from the previous quarter. Most of the protestors’ demands concerned principal reduction, which lowers the amount owed on a mortgage. When trying to help a homeowner whose property is worth less than what she owes on it—meaning she is “underwater”—principal reduction can be more effective than merely lowering the interest rate. But Freddie and Fannie have resisted principal reductions—as has the federal regulator overseeing both enterprises—because of the cost the entities would incur to write down the value of their loans. Fannie Mac spokesperson Brad German defended the agency’s performance. In 2009 President Barack Obama created the Home Affordable Modification Program, known as HAMP, to encourage lenders to modify loans. According to an August update, the program has helped a million homeowners restructure their deals. The program has been criticized, however, for not generating enough modifications. At latest count, nearly 11 million homeowners were underwater, although the vast majority continue to make mortgage payments. The Republican platform is silent on foreclosures; for his part, Gov. Mitt Romney has said he backs alternatives to foreclosure like short sales, reduced regulation to free the housing market, and an end to Fannie and Freddie. Foreclosure might be one of the topics discussed during the presidential race. Carolyn Lomax hopes change comes sooner. A resident in Dorchester, Mass., Lomax, 48, makes her living as a hairdresser. For the most part, Lomax said, she was always able to pay rent for her home, which she shares with her five children. That all changed a few months ago, when her business began to fall off. Some, like the Neighborhood Economic Development Advocacy Project (NEDAP), believe the companies that service home loans need to be forced to assist homeowners more effectively. “What we really need are very strong national servicing standards that hold the servicers accountable,” says NEDAP’s Josh Zinner. After the protest, Hayes headed back to Poughkeepsie, still doubtful and worried about what will happen to her neighbors. Democrats avoid talking about poverty. Republicans back policies premised on outdated ideas about the poor. And the media doesn’t take either side to task. In heavily Democratic Kings County, there&apos;s little suspense in the presidential race. But Mitt Romney&apos;s a heavy favorite in a few neighborhoods that favored GOP candidates in 2004 and 2008. Great nations feature great cities. But American campaigns usually don&apos;t. Four years after voters elected a president who pledged to do more for cities, is that about to change?